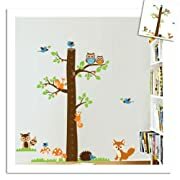 This Mural for Nursery Wall Themes for DIY decorators section shares some clever and unique do it yourself baby nursery decorating ideas. I have transferred a heap of fun nursery decorating ideas from another page I had, so it has a lot of products featured that you can buy online and get conveniently home delivered. 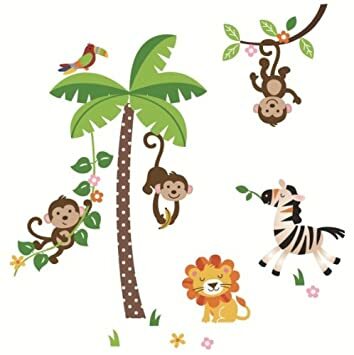 There are also a heap of do it yourself baby nursery decorating ideas that I had a lot of fun with that are based around creative ways to use a tree wall mural for nursery themes including jungle and monkey themes. 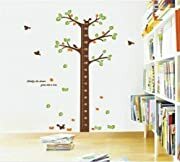 The nursery tree transfers are so good for such a big variety of themes, I think that you will enjoy some of the ideas I have come up with on this page! Choosing the decor for your baby's nursery can be very exciting - and very overwhelming. With so many mural for nursery themes and designs available, it can be a difficult task to decide how you want your baby's nursery to look. 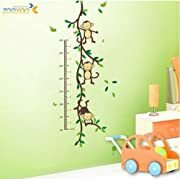 On this page I have found and featured for you some of the most adorable nursery wall murals that will brighten up your baby's room and make it special and unique! You'll find a great assortment of designs here for adding that special touch to the nursery from animals to fairytales, and everything in-between. Add matching colors and accessories for the perfect baby room! This lovable old friend is perfect for anybody! Who doesn’t like a fluffy hug? Winnie the Pooh motifs have many different styles to choose from in of itself. There are bright colors, pastel colors, color blocks and beige designs to choose from. Paint a huge tree on one wall and make a sign that says “100 Acre Wood” so it is just like where Pooh lives. Murals or pictures of the rest of the cast along the walls add for more color. 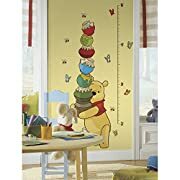 You have a huge range of colors to play with if you pick a modern nursery design theme like the one shown here, the: Winnie the Pooh & Tigger - Children's Mural for Nursery Wall Stickers - then the decor and accessory ideas are unlimited! And best of all, these mural for nursery sticker designs are easy to apply and makes decorating simple and fun! First and foremost, you want to pick a mural for nursery décor that you are going to love. 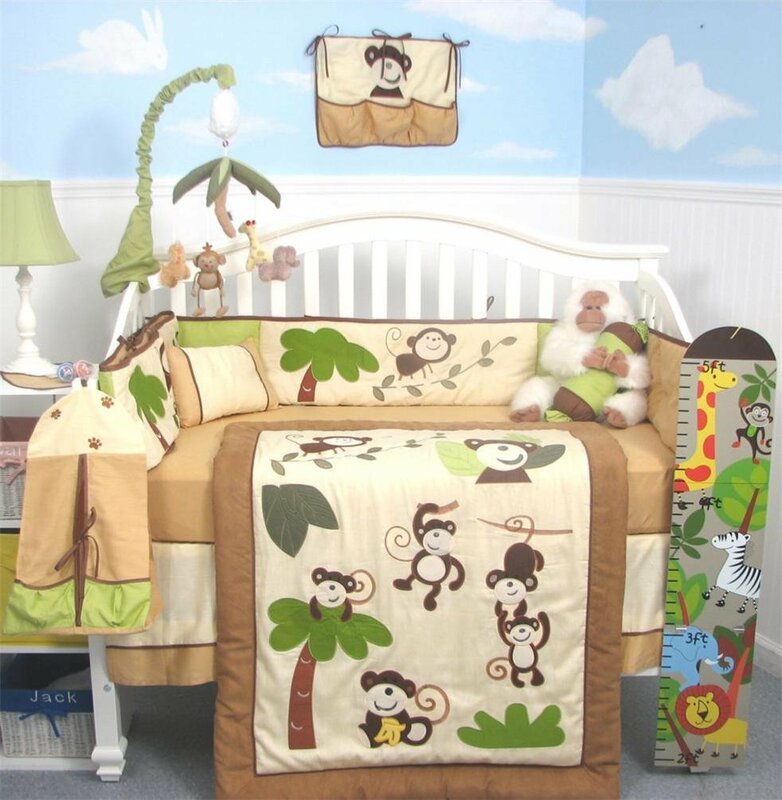 Like this Monkey Mural for Nursery and matching accessories! This is not only going to be the room for your baby, but it is also a place that you are going to spend a lot of time in. While giant teddy bears and dolls may be sweet, if these things aren't going to appeal to you, then chances are they aren't a good choice for the decor of baby's nursery. Choose something that reflects your personality, your style and your interests. For example, if you love the beach, consider going with a soothing beach themed room or if you love music, opt for a music themed nursery. This is a theme you can go wild with! Use an artificial or painted tree in the corner of the room. 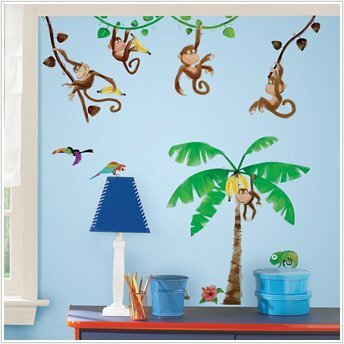 Paint or hang jungle stuffed animals in the tree and surrounding area to make a vivid picture. Little feather butterflies from the craft store can be nailed to the ceiling and walls. Or What about Timeless Designs Like Castle Wall Murals? Most little girls dream of being a princess at one point in their lives. Mothers like to carry this on for their daughters and make a castle out of the nursery. The theme can carry over to bedding and wallpaper or just with a few simple pictures hung on the wall. Paint a castle tower on one wall or a scene from inside the castle. For your baby nursery decor idea, pick something that it timeless; in other words, something that can grow with your baby. Instead of painting the entire room from ceiling to floor in pink, paint the walls a neutral color and add pink accents. The accents can be easily changed, whereas painting the entire space can be timely and expensive. The image comes in 4 parts, very easy to align and apply! Let your imagination run wild. This space is supposed to be lighthearted and whimsical. Have fun with the decorating. Make it look like a fairy garden or a pirate ship. Not only will such whimsy be stimulating for baby, but it will be lots of fun for toddler. Instant Murals can be created by using smaller Dragonfly Wall Transfer Stickers! Be loose and free flowing when you create this magical wall decor design! Even the least artistic and creative of parents can make a nursery wall POP with this design! Is there anyone more fun for a boys nursery wall mural than Curious George? Choosing the nursery design theme can be the trickiest part for new parents. Hang vinyl records and framed vintage images of your favorite rock and roll bands on the walls. Throw a shag area rug on the floor and create a mobile from small plastic instruments. Paint the walls in calming beach inspired hues, such as pale blue or sage green, cover the floor with a sand colored area rug and display pictures of the ocean on the walls. Many nursery rhymes involve the stars and the moon. And since the stars and moon represent bedtime, there isn’t a better place to use this theme. Little glow in the dark stars can be placed on the ceiling and around the room with sticky stuff. Make sure when placing the stars that they are not where they can fall into the bed or be pulled off and put into the mouth. If you don’t want sticky residue, paint stars on the ceiling. Be serious and follow the patterns of the constellations. A moon and stars themed nursery is out of this world for baby. Paint the walls a pale shade of blue. Hang pictures of the cosmos on the walls and use a projector that casts stars up onto the ceiling as baby's night light. Paint an accent wall a bold color and display geometric prints on the walls to create a posh modern space. This Rainbow and Clouds theme is the simplest unisex theme you can get! Mix these clouds, hovering around a bright rainbow with a few other wall sticker designs and you can modify it for later on when you know if the nursery is for a boy or a girl... with this design of Over the Rainbow + 22 Fluffy White Clouds, it also means that you can simply keep adding on to this base design as your child grows up. 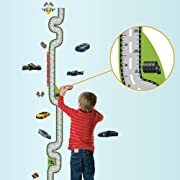 If you have a boy, it is a snap to add animal themes, or create a jungle, or very boy themed truck and train wall stickers even! How about filling the sky on the wall with Boys own Adventure Vintage Air Planes? 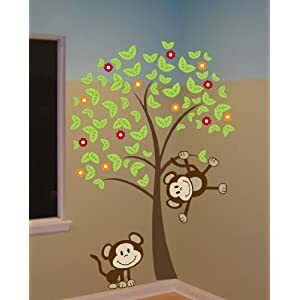 Or how about sticking a colorful Jungle Monkey Peel & Stick Giant Wall Decal like this Curious George to create a bright and fun addition to the room? 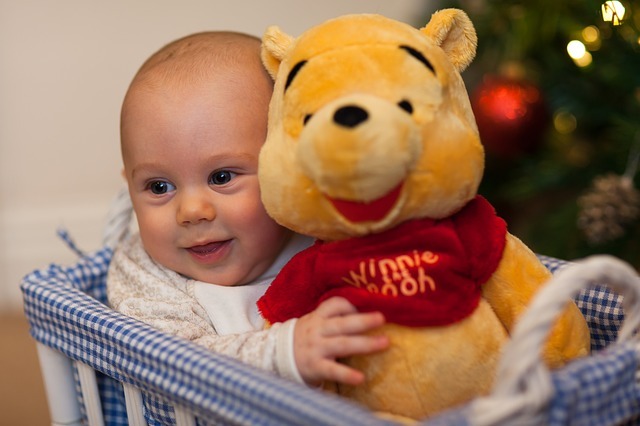 You can keep the theme universal, so that it is guaranteed to suit your next baby - by including some Winnie the Pooh or similar Storybook or Fairytale characters that suit both boys and girls interests. Each birthday you can make a point of adding a new feature to one of the walls, or the furniture, to accessorise what was at first a simple Rainbow and Clouds theme!!! 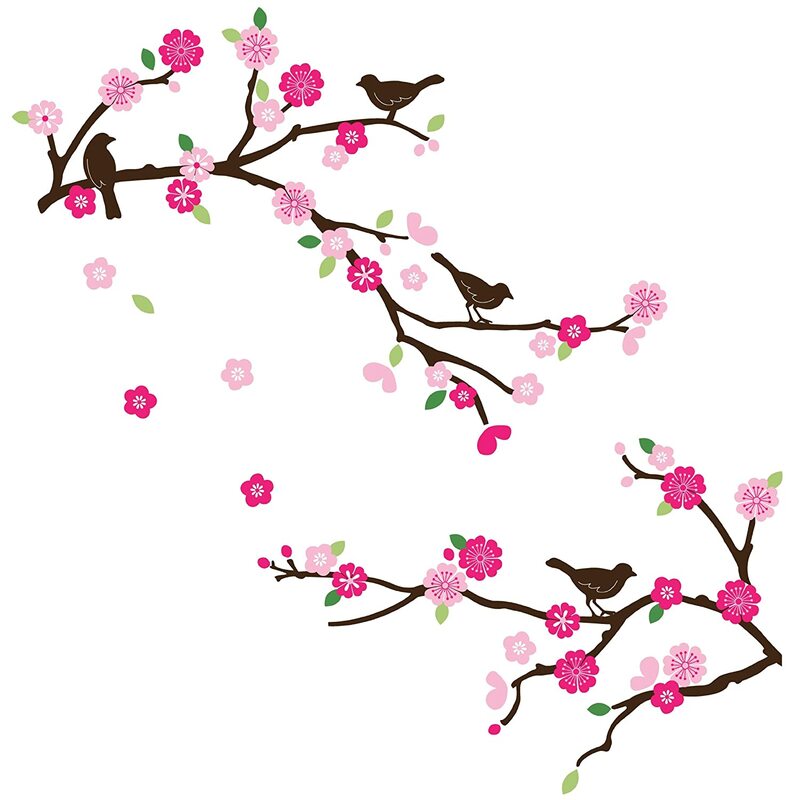 Cherry Blossom & Birds is a sweet theme for a baby girl's nursery wall. 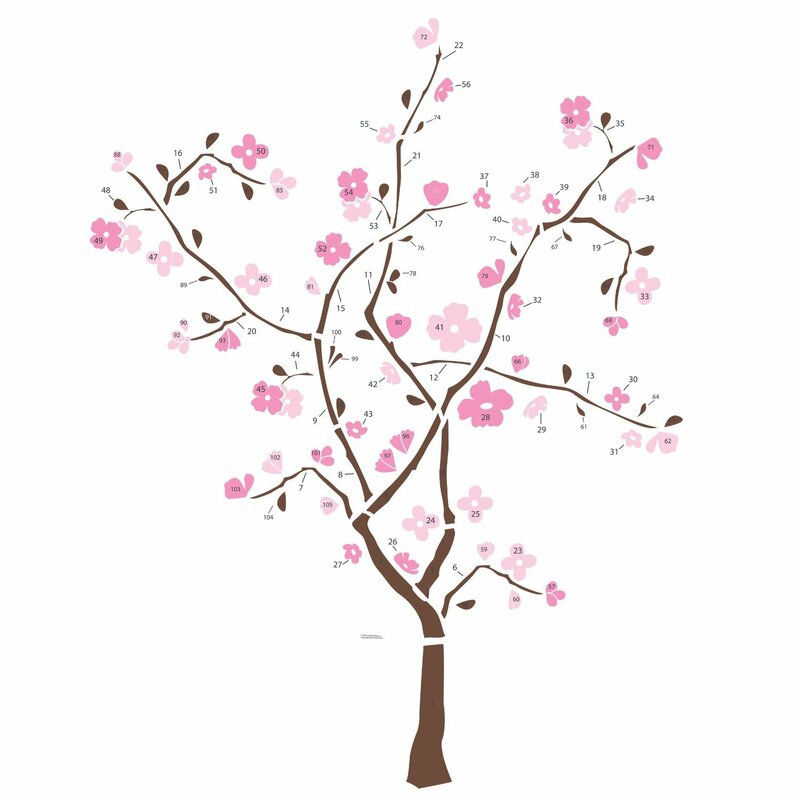 As your little girl grows up you can keep adding stickers in this nursery decorating theme, with more flowers, butterflies, adding more cherry trees like this one: Blossoming Flower Tree Wall, or going all pink with extra cupcake and princess theme wall decals and stickers that are available in various shades of pink. Even a teenage girl will love an oriental theme like this, plus a few dazzling pink Butterfly & Flowers... even her phone case will be pink after all, so this design will never go out of style. 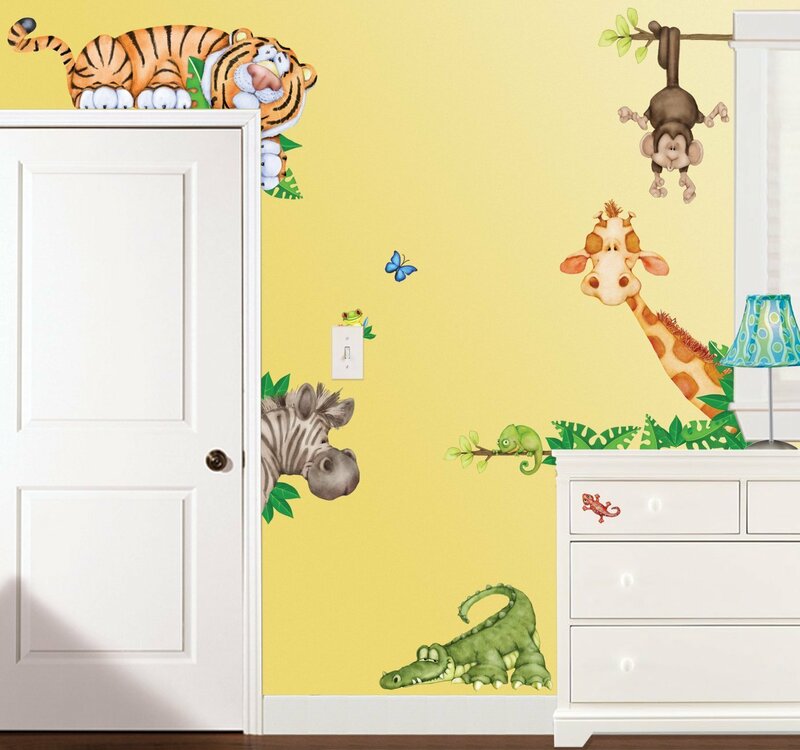 And if you select re-usable stickers in your accessorizing, it's simple to remove and update the extra nursery wall mural accessories as the years go by. Peel and Stick Wall Borders are also a great way to brighten a room wall without committing the whole nursery! And this cute one suits both boy and girl babies! For instance, a wall border can look like this one, which gives the look of a shelf of adorable stuffed toys just waiting to be played with! If you like the idea of a Cuddle Buddies Peel and Stick Wall Border you should check out the full range. There is also a beautiful blue underwater themed one that would suit a nautical themed nursery, for instance. 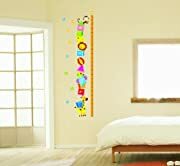 But this theme can also be accessorized by matching this cute wall border with it's very own matching Stuffed Animals - Large Stick-up Growth Chart that you can just stick to the wall or door, and measure your tot as they grow taller inch by inch over the years! This design is such a cute way to start filling the wall with make-believe shelves of stuffed toys, and of course, it is suited to both boys and girls nursery themes - so if you don't know which way to go yet, you can be safe with this design themed mural for nursery! A very popular trend in wall murals is to use clever nursery wall sayings to stick on the wall! Posters can bring art into a room, nature or even sports figures. It is also a relatively inexpensive way to bring color or design into a room. Not to mention the easy way out if you have no artistic talent and can’t paint or stencil. Posters are also good in the way that when you want to change a theme, all you have to do is pull them down. Wall saying like this one " All because two people fell in love ... " are a brilliant way to add a bit of personality and style to an already beautifully decorated nursery wall. And if you select the perfect nursery wall saying, it will be suitable for many years to come! Here are some of the most popular nursery wall sayings that people are buying online and using on their nursery walls to inspire both the parents and the child! With a butterfly kiss, and a ladybug hug, sleep tight little one, like a bug in a rug! I love you to the moon and back again! For every new parent, they have a vision of what the perfect nursery should look like. But really, is there any need for you to spend $2,000 in order to decorate and furnish a space that, in a couple years, they will have outgrown? In fact, you do not need to spend a fortune on decorating a nursery for that new arrival. Here we will look at several different ways in which a nursery can be decorated no matter how small your budget is. 1. Instead of using wallpaper, paint the nursery instead. Why not choose colors which will co-ordinate with the baby’s toys, rather than going for the traditional colors? Also, why not invite friends and family round and get them to dip their hands into a pot of paint and place their handprints on the wall? They could even sign their names underneath if they want. Doing it this way, your baby will get to enjoy a brightly colored room full of contrasting patterns. This is of especial appeal to young infants. Also, it is an interesting way of introducing them to those people who will be important in their life as they grow up. 2. You do not have to be artistically inclined, but if you want, why not add some stencil designs to the walls? This is inexpensive, as well as an easy way of adding different elements and features to a baby’s room. However, it is best to choose stencils which will match the theme of the room. 3. Where the floor is concerned, make sure that you have a stain resistant carpet, or just have hardwood floors with some scatter rugs on it. But if you already have carpet lay and you are worried that it may not stand up well, then why not get an area rug which will cover and protect it? 4. When you are decorating a nursery, why not consider buying some pieces secondhand or used instead? The advantage to this is that you may find items that are of a higher quality than you would normally purchase. Or it may be you find a vintage piece of furniture, which you can then refinish to match the décor of the nursery. 5. Why not get an old, beat up chest of drawers, and then paint with a high gloss paint, and then replace the handles on it? 6. Also, consider buying a piece of furniture that can be used for many different things. Do not spend money on buying a changing table, rather, buy yourself a dresser that is about waist high, and sit a changing mat on top. Then fill the drawers with all your nappy needs. In order to stop the pad from slipping, place a small bath mat with rubber backing face down underneath it. Then, once the child is older, the chest of drawers can be used as it was intended. 7. Instead of spending large amounts of money on buying storage boxes for your nursery, why not use baskets and shelves instead to store toys and other infant essentials? There are many decorating ideas around for nursery and which will save you money. Hopefully, the ideas above will help you when making decisions on how to decorate a nursery on a small budget. Remember to Include a Wall Growth Chart! Your baby will grow up amazingly fast. One day they can be held in the palm of your hand and the next, they are towering over you. Buy a paper growth chart and hang in the nursery. 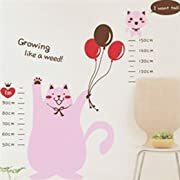 Many growth charts are made to match a specific room theme, so you can even coordinate this into the décor of the room. Mark growth regularly so you can see how fast it really does happen! 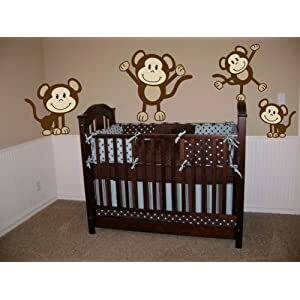 Remember that for the first couple of years YOU are the one to spend time in the nursery with baby, so YOU need to be the one who totally loves the decor, not baby or the relatives! 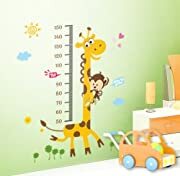 I will be adding more useful mural for nursery wall themes and ideas for you over time, including more pages of nursery decorating tips and products you will see the links to below. If you have some ideas or suggestions for decorating ideas that you know have worked well for you, please do share them with us here - and I'll create your very own page on the site! Back to HOME PAGE of this mural for nursery wall themes section of the site.